Emeralds are made from beryl – a mineral that may appear in a variety of colors. The most common however, is the green variety which has been made popular by stones such as emeralds and aquamarines. Although naturally transparent, a wide range of inclusions and impurities (which may mean elemental additions, within a mineral’s structure, that’s not a pat of its core structure) may cause beryl to showcase different shades. The oldest emeralds are about 2.97 billion years old. By comparison, fossils found in Canada back in 2017 were dated to at least 3.95 billion years ago. In essence, emeralds have been the product of chemical reactions on Earth billions and billions of years ago. According to the Gemological Institute of America, the oldest emeralds are from South Africa. It was said that ancient emeralds were famously mined from the Cleopatra Mines in Egypt over 4000 years ago. Numerous articles about emeralds categorize the stone as one of the most delicate and fragile stones. Emeralds measure between 7.5 to 8 on the Mohs Scale of Hardness which makes it stronger than other stones like turquoises, pearls, and opals. Even though emeralds are still relatively sturdy, the presence of fractures and inclusions that give each stone its personality and unique beauty can also affect an emerald’s durability. Considered as one of the rarest and most fragile of precious stones, emeralds may sometimes be more valuable than diamonds depending on the chemical composition and the work that’s been put in it. Traditionally speaking, high-quality emeralds may be worth than diamonds based on a per carat basis. Much like diamonds, emeralds are graded using the 4Cs: color, clarity, cut, and carat weight. 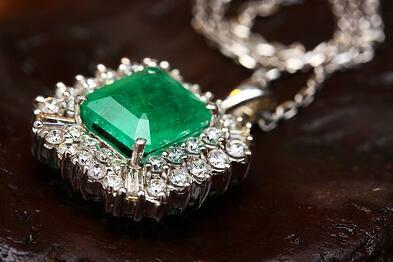 However, color is the most important characteristic for an emerald. Color determines the quality of natural emeralds as well as the amount of inclusions in them. Unlike other stones, most emeralds are graded with the naked eye, unaided, and without magnification. Aristotle, an ancient Greek philosopher and scientist and considered as one of the greatest thinkers in politics and science, was known as the earliest western figure to reference emeralds in literature. Apparently, Aristotle was a known fan of the gemstone and claims that owning an emerald magnifies a person’s presence in public and adds that donning emeralds during meetings commanded the attention of the audience. Interestingly however, Aristotle also believed that emeralds prevented illnesses. Because of these supposed qualities, paired with how rare these stones are, emeralds have become a favorite among royalty and aristocrats alike. Other royalty and historical figures that adored emeralds are Queen Victoria (who was famously given a stunning emerald tiara by her husband, Prince Albert), the Romanovs of Russia, and the Mughal Rulers of India among others. Speaking of royalty, few can go toe-to-toe with the revered epitome of elegance – Egyptian Queen Cleopatra. Cleopatra was said to be obsessed with emeralds – even claiming a mine for herself after taking it from the Greeks. Like the early Greeks, Egyptians also believed that emeralds have the ability to cure diseases as well as help with fertility. Egyptians also believed in burying their dead with emeralds to symbolize eternal life/youth. It is a known fact that the emerald’s green hue is derived from different elements such as chromium, vanadium, and sometimes iron. An emerald’s green-ness depends on the presence (or absence) of each element and their relative amounts. Meanwhile, an uncommon fact is that the emerald color may also be associated from where it was mined. For instance, Zambian emeralds tend to have a more bluish to grayish cast while Brazilian emeralds tend to be darker in tone and more heavily included. The finest emeralds, however, may be found in Colombia. Colombian emeralds are known to have a warmer hue and a more intense green hue. There are a lot of symbolisms and legends associated with precious stones. Historically, emeralds were perceived as mystical talismans that helps the bearer exude power, eloquence, and superiority. Early people also saw emeralds as a stone that is associated with love, fidelity, inspiration, wisdom, harmony, growth, patience, peace, and abundance. Emeralds were also believed to be the sacred stone of Venus, the goddess of love. Much like other precious stones, emeralds are also graded through its color, clarity, cut, and carat weight. These four factors are used to determine the value of an emerald. However, color is the most important factor for emeralds. The best color is a deep vivid green or bluish green with even saturation and little to no color zoning. Emerald clarity may be judged or graded, as mentioned above, by the naked eye. Jewelry trade members and educated consumers understand the presence of inclusions in emeralds – the clearer natural emeralds are, the more valuable they can be. As for emeralds, the most popular cut is square or rectangular step cut (more popularly known as the emerald cut). Like diamonds, emerald carat weight depends on quality for quality meaning the price increases as the size increases. According to the Gemological Institute of America, it is a known fact that emeralds are risky to clean. However, using warm, soapy water – coupled with gentle scrubbing may be the safest way to clean emeralds. Using micro-fiber cloth or a soft toothbrush – paired with light scrubbing/brushing may also be an option. If you are wary of scrubbing your emeralds, submerging it in lukewarm water may also be an option.